Last week we shared some tips for getting the most out of Google Buzz for mobile. We're back with more ways to help you become a power buzz poster and find the most interesting buzz while you're on the go. Try these 5 tips for the Google Buzz for mobile web app (buzz.google.com) on your iPhone or Android 2.0+ device. 1. Post buzz with your voice. You can post your public buzz simply by speaking it. From the Google Mobile App for iPhone or Quick Search Box on Android, select the voice search icon, say "post buzz" followed by the text you'd like to post, and watch your words appear. Before your post is sent, you'll be able to edit it or change its tagged location. 2. Filter the Nearby tab for a specific place. From the Nearby tab, you can easily filter buzz by a specific place, such as a sushi restaurant you're about to walk by, to only see posts from that place. Open the menu showing nearby places, for example "Tartine Bakery and 20+ other locations nearby," and then select a specific place from the list. Now, you'll see all the public buzz anyone's ever posted from that place or you can quickly create a post that is tagged with the place. To go back, just open the same menu and select your current location shown with the blue dot. You'll once again see all the recently posted buzz around your location. As you'd expect from any Google product, Google Buzz for mobile has a powerful search feature that lets you search all public buzz for topics that interest you. Open the menu or just select the magnifying glass icon to see the search bar. You can also search specifically for nearby posts by checking the "Search nearby" box before submitting your search (it's already checked if you're in the Nearby tab). Now you can find out what people around you are saying about the closest pizza spot or a traffic jam. 4. Post from your city-level location. Tagging a post with your location is easy and adds context to your buzz posts. Sometimes, your post isn't about a specific place or you'd rather not share your exact location. You can easily show your city-level location, so your post has a general city location tagged and will be browsable in the Nearby view and Maps Buzz layer. When posting, just select the ">" in the location box, scroll down, and select the city-level location option. On the other hand, sometimes you really want your location to be exact. When you visit the Nearby tab or want to tag your post with a location, Google Buzz will try to get your location using your phone's GPS. If you're not happy with the location accuracy, you're moving, or you're just stepping outside to get a GPS signal, hit the 'refresh' icon to tell the Google Buzz web app to get your location again. You can also learn more about troubleshooting location problems. Stay tuned for more tips! Visit our Help Center to learn more or tell us your feedback and questions in our Help Forum. You can also give us suggestions and vote on other people’s on the Mobile Product Ideas page. I also don't really understand why the desktop version of Buzz doesn't include a Buzz layer for maps (so you can search around and see local Buzz on a map, which is the neatest aspect of Buzz) or any way to set your location. Some of us have laptops. And at the very least we could set our general, town-level area/sticky locations. Heck, I would LOVE to see just a map of my own buzzes that could even play out my updates and locations like google latitude can. Having a desktop way to browse geotagged Buzz is one of the things that could really sell people on Buzz as truly innovative. Are you going to release an official app? The web app is "okay," but unless I can upload images and video, I'll probably not use it (the same applies to other social networks as well). how about getting buzz working for pre 2.x versions of android before giving anyone any tips. i dont get it .. why would google take a dump on its own platform. Gee, I'd love to play around with these new tools, but hey, first adopters like myself who own a G1, apparently will be left out of the 2.0+ update. Since I'm a Korena, I can tell that no.3 tip doesn't work on Korean Characters. When I search anything on my iPhone mobile buzz, the result end up to show my general timeline, not the search reult. Maybe this is problem of not only Korean but non-Latin letters. You should investigate. The speaking "post buzz" trick would be awesome -- if it worked. It doesn't. And several people on Buzz agree with me. When I say "post buzz", my app searches for the phrase "post buzz". Not exactly helpful. And I downloaded the app, from the Canadian iTunes store, today. Kind of frustrating when your number 1 tip doesn't seem to work at all. I'd like to be able to select a bus line or train color to choose from while posting during commute. It's less about "exactly" where I am in route but the fact that I'm riding a certain bus/train. You could mention that it only works on android 2.1. Most of us are still pre-2.1. The "post buzz [message]" does not work on the iPhone Google app. Instead of opening the form with the message it searches for the whole said sentence. i've tried thousand times but Post Buzz with voice never worked. it always go to Google search result page instead of going to post the words on Google Buzz. 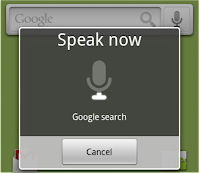 if any of u could successfully post Google Buzz with voice, please let me know bcoz actually this is so interesting. Not working for me either in Canada. Not from my iPhone at least. Thanks to everyone for your feedback! We're hard at work making the web app and some of your requested features available in as many places as possible, including your computer, more phones, and countries. (For instance, Voice posting shortcuts are only available in the US for now). If you want to make sure your voice gets heard, check out our feedback channels! And check out the help center if you have other questions! See you next time for tips & tricks on Buzz for mobile! It works for me- just speak "post buzz this is awesome" and it asks for your location and to sign into buzz and then posts it. iPhone 3Gs in the US.